Bullfights and other bull events: Description of the bullfights, the Vasco Landesa show, and the Rejones - bullfighting on horseback. The most famous bull breeding ranches, how to get tickets, what the Pamplona bullfights are actually like: difference between seats in the sun and those in the shade, the Merienda or afternoon snack. The bullfight is one of the cornerstones of the San Fermin fiestas, as demonstrated by the fact that, during the festivities, most activities are centred around bulls. Records reveal that bullfights were already being held in Pamplona as far back as 1385. From 1591 onwards, bullfights were institutionalised and gradually acquired the importance they have today. In addition to the bull running (Encierro), the short evening bull run (Encierillo) in which the bulls are taken to the pen on the eve of the run, and the procession of the mules, other bull events were also created, such as the Apartado - separation of the bulls into individual pens before the fight, the Recortadores - teams of men who attempt to place rings on the horns of young bulls, and the Vasco Landesa show in which groups of young men perform spectacular acrobatics with the bulls. Bullfights are held every afternoon at 6 30 pm onwards from the 7th to 14th July, with the participation of famous Matadors (bull fighters), fighting bulls from the most important bull breeding ranches in Spain. However, the Pamplona bullfights are not unique for what actually happens in the ring, but for the spectators' activities, specifically those in the seats in the sun. The Peñas (San Fermin social clubs) invade the seats in the sun, set on having a good time, full of liveliness and gaiety, in direct contrast to the seriousness of the Aficionados (bullfighting fans) with their seats in the shade. The present-day Pamplona Bullring was constructed in 1922 in record time. It is the third largest in the world and pertains to the charity organisation La Casa de Misericordia, also known as La Meca, and serves to obtain funds for financing its social work. 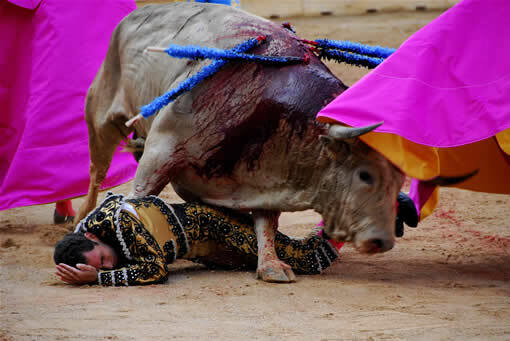 Each afternoon the same ritual takes place prior to the bullfight. First the mounted Alguacilillos (constables in ancient costume at the orders of the president of the bullfight) go out into the ring, trotting round in circles on their horses, playing at passing each other. Then the three Matadores (bullfighters) on the bullfighting program for that day make a grand entry followed by their team comprising Subalternos (assistant bullfighters) and the Picadores (mounted lancers), in bull fighting terms this parade is called the "Paseíllo". 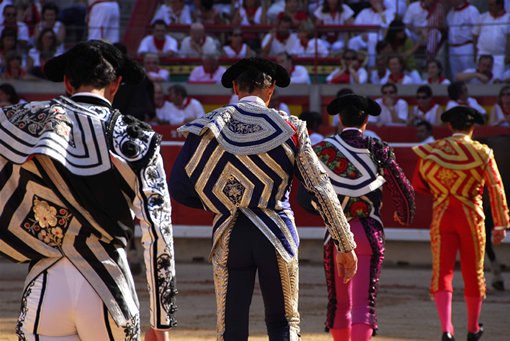 A trumpet announces the release of the first bull into the ring, and the Subalternos try to attract the bull's attention with their capes whilst the Maestro (master bullfighter) studies each of the bull's movements from behind the wooden shelter. After the team has tested the bull, the Matador commences his performance in the ring with a few cape movements in which animal and bullfighter measure each other up. The mounted Picador then enters the ring and faces the bull with his pike, to weaken the bull's prowess. A roll of drums signals that it is time for the lancers to retire and for the commencement of the second act of the fight in which the Banderillero (bullfighter under the orders of the Matador) shows his dexterity by placing three pairs of beribboned darts or Banderillas in the bull's withers. The Matador then proceeds to offer the public a series of passes with his cape, after which he goes to stand before the president and dedicates his Faena (work done to kill the bull) to a particular person. His stay in the ring cannot exceed the ten minutes stipulated by the Bull Regulations. When this time is up, he must go in to kill. Six bulls are fought each afternoon in the ring in a tournament in which the President decides when it is time to change to the next act (3 in all) and ensures that the Regulations are complied with. He also has the final word when deciding the trophies (such as the ears and tail of the bull) to be awarded to each Faena. The post of president generally goes to a member of the Pamplona council, who is advised by three consultants and a vet. The presidential box is located above the first section of seats in the ring. During the San Fermin fiestas, there are other bull events to be seen in addition to the actual bullfighting. For several mornings the bullring is the venue for the national Recortadores contest in which teams of men attempt to place rings on the horns of young bulls, Fiestas Camperas- amateur bullfights in which the bull is not killed, and the traditional Corrida Vasco - Landesa, a show which has barely changed over the centuries. This is the so-called acrobatic bullfighting in which the bullfighter leaps over the animal's horns creating a kind of fusion between man and beast. In the meantime, the rest of the team, dressed in white, make different types of movements to get the bull running round in circles and turning sharply. This festival is suitable for all ages as the bulls are neither injured nor killed in the ring. During the Recortadores contest, the young men delight the audience with all types of movements in front of the bull's horns: Quiebros to deceive and dodge the bull; Cintas to make the bull go round in circles and Recortes a pass which makes the bull turn so sharply it comes to a stop. Both shows are a revival of centuries-old bull-fighting traditions from the Basque - Navarre culture to offer an extraordinarily beautiful performance. The best breeds of bulls are brought to Pamplona to take part in one of the most prestigious festivals in Spain. Improvements in transport have led to a diversification in the ranches supplying the bulls, which are now brought from the south of Navarre, the centre of Castile and Andalusia, in addition to other parts of Spain. Some of the most famous brands include: Pablo Romero, Miura, Murube, Cebada Gago Domecq and Jandilla, in addition to Victorino Martín Andrés, Dolores Aguirre Ybarra, Antonio Bañuelos y Fuente Ymbro. Hros. de D. José Luis Osborne Vázquez and Alcurrucen. Along the way the bulls rest at various enclosures before finally reaching Pamplona. Once here, they will get to know three more Corrales or enclosures: the Corrales del Gas, where all the herds are kept, the corralillos, a small pen in the street of Santo Domingo, where the bull running starts, and the Corrales in the Bullring before the fight, which conditions their attitude in the ring. During the Pamplona Bullfighting Festival, 48 bulls and 6 three-year old bulls are sacrificed during the afternoon tournaments, a festival well-known for the special prominence given to bulls. In 1959 this was the first festival in the world to give a prize to the best bull. That year "Rabioso" from the Alvaro Domecq herd won the award. 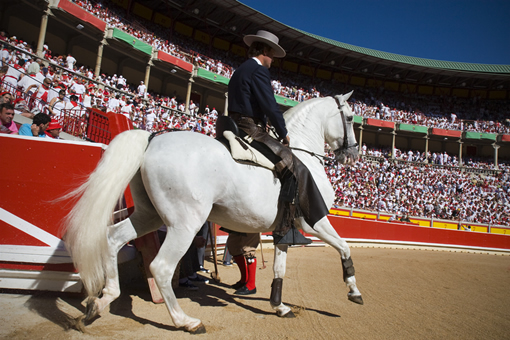 Participation in the Pamplona Festival brings prestige to any ranch, although this also involves much responsibility. Large, brave, big-horned bulls are preferred. The Carriquiri Award is given each year to the bravest bull of the festival, and the Feria del Toro Award is in recognition of the most popular herd in the bullring. Over the last few years, prestigious brands from abroad have also participated in the festival. In the afternoon, just before the fight, the bulls are separated into individual stalls, an activity known as the Apartado. Access to view this event in which it is possible to get a close look at the bulls is by ticket only; these can be purchased at the bullring ticket booths on July 6th from 10 am to 1 pm for all the days or, from 10 a.m. on the 7th July onwards, just for each particular day. 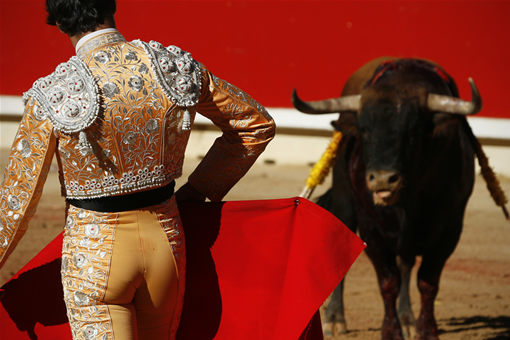 If you wish to attend a bullfight during the San Fermin fiestas, you should bear in mind that it is not at all easy to get tickets, given the fact that 90% of the seats are reserved for season ticket holders. After the bullfight, the remaining seats are put on sale for the following day, if any seats are still unsold then these are put on sale on the same day as the bullfight. Tickets for the 7th July are put on sale on the 6th July from 10 am onwards. You need to queue to try and get a ticket which are for the Andanada section - the high seats on the sunny side. Normally the "sold out" sign quickly appears after the ticket box has opened. There are no bullfighting events during the rest of the year and the bullring remains closed. It is only during the San Fermin festival that the general interest for bullfighting is aroused amongst the Aficionados (bullfighting fans), with mass participation in this event. However, in this respect, Pamplona stands out for the two evidently contrasting ways of enjoying this tournament, revealing two very different atmospheres: the seats in the shade are occupied by the serious bullfighting enthusiasts, who fully appreciate the different moments of the Faena. This is where the experts sit, although not everyone is one. Here there is a relaxed and attentive attitude towards the progress of the bullfight, with well-dressed, elegant spectators, in stark contrast to the public occupying the seats in the sun. The seats in the sun are synonymous with the Peñas or San Fermin social clubs, and their enthusiasm for having a good time. For the three hours of the bullfight, the young people of the Peñas spend their time dancing, singing, jumping around and, above all, drinking and enlivening the atmosphere in the bullring. Each afternoon the Peña members take buckets of drinks, particularly Sangria, and every type of food imaginable to the bullring. All in large quantities. The sangria and other drinks serve to quench their thirst created by the hot July afternoons, if not spilled onto the clothes of nearby spectators. As it is customary for drink to be thrown and sprayed around, many wear hats and plastic macs! Each Peña has its own place in the sun section; the coloured smocks and songs and banners serve to distinguish one Peña from another. However, despite the mayhem present in the seats in the sun, the young people still pay attention to the Faena and, if necessary, applaud or boo the good movements or faults made in the bull ring. On another note, the bullfighter's attitude is worthy of praise, a professional risking his life down in the ring to the noise and general uproar coming from the seats in the sun. The Merienda or afternoon snack is one of the typical moments for the Peñas during their afternoons at the bulls. Just after the third bull people start to leave their seats to share pots of salt-cod and pepper stew, mountain ham with tomato sauce, crabs and other typical Navarre-style recipes, hearty dishes washed down with wine, champagne and other drinks, the more alcohol the merrier. In short, the Peñas provide a lively atmosphere at the bullfight, making this a special event, different from other prestigious bullrings. No doubt more than one Aficionado present in the seats in the shade has fond memories of the times in the past when he too was part of the racket in the sun. The Peñas enliven the wait and the end of the event, with their banners and jokes and carefree attitude, whilst the music from their bands fills the evening air.